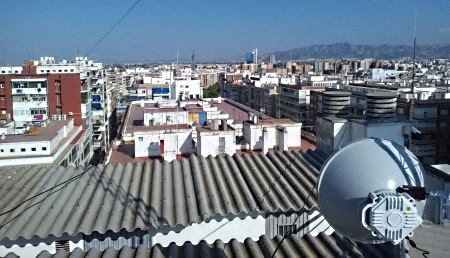 Redlan Telecom Sl, Murcia-based Spanish telecom operator has installed PPC-10G 10Gbps E-band Radio Link. Murcia, Spain — Jan 15, 2018 —ELVA-1 Company reports successful installation of PPC-10G-E 10 GE radio by Redlan Telecom Sl, ELVA’s customer in Spain. The customer chose this radio, because they need to cover a long hop of up to 10 km, and only ELVA link provides 10 Gbps communication at such distance. Spain, as other EU countries has chosen to open the 71-76 and 81-86 GHz ITU “E-band” frequencies for ultra high capacity point-to-point communications under light licensing rules. David Rodriguez Rojo, head of Redlan Telecom Sl has confirmed successful link operation — “We have installed this 10 Gigabit Ethernet connection on trace within Murcia area. The link works perfect with amazing 10 GE full-duplex throughput. At our company, we have never seen such high-performance equipment on telecom market. We are going to use PPC-10G link on distance of about 10 km to a customer’s point that was unreachable for us before”. PPC-10G is IP radio link, providing up to 10 Gbps full-duplex throughput. The link is intended for point-to-point applications such as 4G/LTE/5G Backhaul, Corporate Campus Networks, IPTV, and other Wireless ISP backbones. All ELVA-1 links contains slots for SFP/SFP+ modules and are designed for interconnection between remote WAN/LAN segments that located on the sites with no fixed line broadband connection. Typically, this is for landscape or industrial barriers or ecology restrictions for ground cable laying like national park, river, lake, airport/railway area, private land, etc. Please send all inquiries on PPC-10G via email to ELVA-1: sales@elva-1.com.